The Forth & Clyde Canal is much wider than the average English canal. British Waterways staff currently operate all of the locks and bridges and boaters are not allowed to operate the locks themselves, although help is happily accepted. Between Falkirk and Glasgow there are 4 locks and 3 road bridges, with a further 18 locks and a number of pedestrian bridges between Glasgow and the Clyde at Bowling. 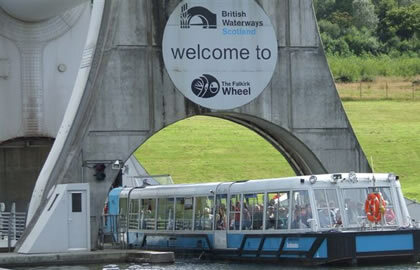 If you are going west on the Forth and Clyde Canal, British Waterways staff will see you through Bonnybridge road lift bridge and locks 17 to 20. You therefore need to contact British Waterways (0845 676 6000) about a week before leaving home to let them know your plans. At lock 20 let the British Waterways staff know where you intend to stop for the night, what time you plan to leave the following morning and how far you intend to go that day. If you plan to go into Glasgow (which is the place to stop for the night, even if you are going down to Bowling the following day), you need to take the left fork when the canal splits at Stockingfield Junction. After Glasgow go back up to the Forth & Clyde Canal to the Stockingfield Junction and turn towards Bowling, and soon you will be passing the substantial 400 foot long four arched Kelvin Aqueductand into the a set of locks to the high point of the canal . Due to the renovation of the Forth and Clyde being so recent the locks on the canal tend to be easily operated and in good working order which is a definite plus point as so many appear in quite a short stretch through Glasgow, the most intensively locked section is around the Boghouse Locks. The canal now heads through the outlying urban sprawl of Glasgow past Clydebank through the Clydebank shopping centre and the 2 pedestrian lift bridges that can have quite an audience as the boats pass through. A little further on the canal arrives at Dalmuir Drop, it offers a somewhat unique experience by dropping the level of the canal to give 10 foot headroom for boats passing under the Dumbarton Road through what is effectively a 250 foot lock chamber before raising the water level on the other side back to the original level. The process can be somewhat lengthy taking about 30 minutes but as a cost saving exercise it is successful, the cost of raising the level of the bridge or re-installing the original swing bridge onto a road that is far too busy for that to be practical would be cost prohibitive. Towards old Kilpatrick and Clydebank, the canal has glorious views of the Kilpatrick Hills giving us a feeling for the rolling beauty of Scotland’s low lying region that the canal cuts through. Kilpatrick is most closely associated with the 500 metre long Erskine Bridge which carries approximately 35,000 vehicles a day between West Dunbartonshire and Renfrewshire, thankfully due to its box girder design and grand height the considerable noise from this huge construction is cushioned somewhat to those who are nearby. Soon the town of Bowling is reached with its two basins at the joining of the Clyde, during the period over which the canal was closed between 1963 and 2001 the basins were kept open for the mooring of craft using the River Clyde and as such were in a perpetual state of good repair. There is a narrow channel between the basins spanned by two bridges, one is a swing bridge for the now defunct Caledonian Railway. The town of Bowling offers opportunity to dine out or stock up on provisions in a pleasant environment.